Presented by Premier Productions - the Australian-based, multi-platinum-selling group Hillsong UNITED has announced that after three years they are returning for their highly anticipated USA Tour in 2019. 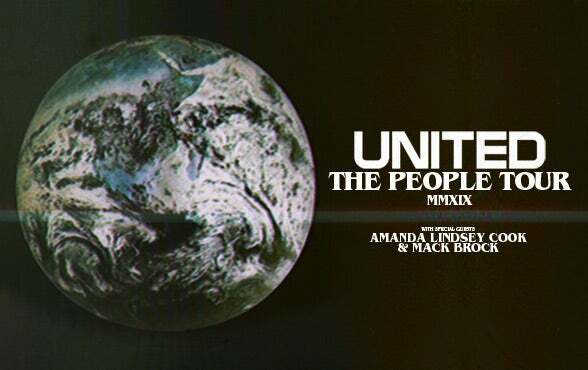 UNITED will be joined by special guests Amanda Lindsey Cook and Mack Brock. Tickets will go on sale Friday, March 1 at 10 a.m. Committed to creating a musical expression that speaks truth, creates a unique sound and connects people everywhere with God, Hillsong UNITED's mission is to write songs that awaken churches and individuals to the fact that we are redeemed and called into the story of God. Making stops in major markets across the U.S., Hillsong UNITED's USA Tour 2019 will transform amphitheaters and arenas throughout the nation into nights of worship. Hillsong UNITED is a multi-award-winning, platinum-selling artist whose chart successes (repeatedly No. 1 on Billboard's Christian charts and up to No. 5 on Billboard 200) are only bested by the millions of lives they've impacted across the globe. Reporting over 50 million people singing from the Hillsong catalogue songs every Sunday, the modest band born from a youth ministry out of Hillsong Church in Australia, touts a reach of over 10 million across all major social network platforms to date, including 1.49 billion minutes garnered from YouTube viewers. Comprised of an evolving, eclectic mix of musicians and songwriters, the band is led by Joel Houston and Taya Smith, names that have become synonymous with Christian radio, dominating airwaves with every new release. Their last four studio albums have each topped the USA Christian chart, with "Zion" and "Empires" charting No. 1 ("Zion" recently also went Gold in the US); "Oceans," written by Houston and band member Matt Crocker recently went triple platinum in the States, counting 200+ million streams and reigning on top of the Christian songs chart for a record 54 weeks. In-studio, on tour or at home, Hillsong UNITED is committed to writing songs that speak truth, create a unique sound and connect people everywhere with God, evident by the success they've seen globally. With over 42 countries and six continents and counting, Hillsong UNITED continues to sell out arenas and stadiums around the world, including sold-out nights at the Forum, STAPLES Center and The Hollywood Bowl in Los Angeles, The Toyota Center, Oracle Arena, Air Canada Arena, American Airlines Arena (Miami and Dallas) and Red Rocks to scratch the surface. Hillsong UNITED profoundly functions from the deep understanding that everything they do is an expression of a really extraordinary God doing what only He can do, through really ordinary people. For more information, visit hillsongunited.com or @hillsongunited on all social platforms. Pollstar Magazine ranks Premier Productions as the largest producer of live Christian events both nationally and internationally, producing more than 600 events this year. Premier promotes Tours for Hillsong UNITED, Hillsong Worship, Young & Free, Kari Jobe, Jesus Culture, Lecrae, Lauren Daigle, Gaither Homecoming, Sadie Robertson, The Newsboys, comedian John Crist, Rend Collective, as well as their annual Winter Jam Tour Spectacular and OUTCRY Tours. Premier Festivals promote 10 of the largest Christian festivals in the U.S, and more than 80,000 guests have sailed on cruises and gone on excursions through their vacation experience company, Premier Experience.